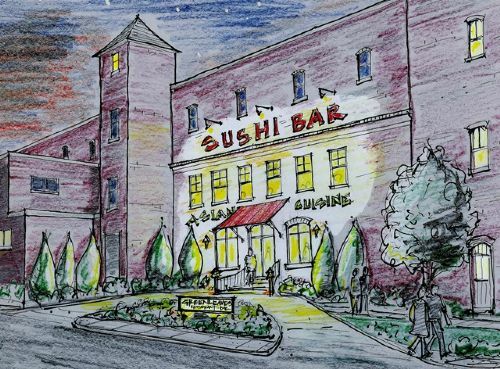 This sketch shows a restaurant concept for a vacant mill property. Part of the design challenge is that the existing building is located on a low traffic side street in an older industrial area. The dramatic lighting and signage are intended to attract interest from other streets while the landscaping softens the facade, welcomes patrons, and creates the feeling of entering a courtyard. The intent is to create a destination in a part of town not known for its nightlife or restaurant scene. The interior plan is a soaring two and one half story space with mezzanine seating areas all focused on the central sushi bar and its working chefs.